This is just wrong. Saw this at the Wake Forest Wal-Mart yesterday. I suspect the collectible mini-figs would be a huge shop lifting problem. Looks to me like someone helped themselves to a couple mini-figs. 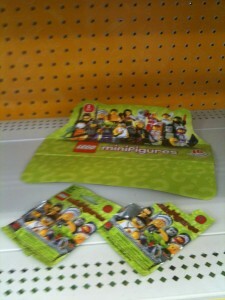 This entry was posted in Shopping and tagged Collectible Mini-Figs, Series 3, Wal-Mart. Bookmark the permalink.